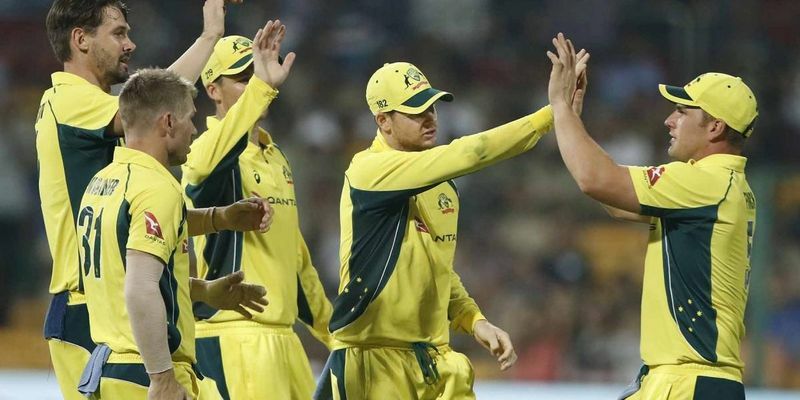 Australia finally tasted some success in the ongoing series as their bowlers succeeded in keeping the Indian middle-order quite en route to a 21-run victory in Bengaluru. Earlier, Aaron Finch (94) and David Warner (124) shared a 231-run partnership to guide the hosts to a competitive total of 334. Brief scores: Australia 334/5 (David Warner 124, Aaron Finch 94; Umesh Yadav 4/71, Kedar Jadhav 1/38) beat India 313/8 (Kedar Jadhav 67; Rohit Sharma 65; Kane Richardson 3/58, Nathan Coulter-Nile 2/56) by 21 runs. After winning the toss on a nice and hard pitch in Bengaluru, Steve Smith opted to bat first for the second consecutive time in the series and brought in Matthew Wade and Adam Zampa in place of Glenn Maxwell and the injured Ashton Agar. Having already won the series, India decided to rest Jasprit Bumrah, Bhuvneshwar Kumar, and Kuldeep Yadav and hand opportunities to Umesh Yadav, Mohammed Shami, and Axar Patel in their place. Aaron Finch and David Warner got Australia off to a great start making most of the rusty Indian opening bowling pair of Umesh Yadav and Mohammed Shami, who lacked any competitive match practice and bowled wayward deliveries. On a pitch where most of the balls stayed low, the duo were happy enough to stay back and punished the bad deliveries through the infield and didn’t risk too much. However, that didn’t affect the run-rate as the visitors reached a score of 63/0 by the end of the first powerplay. The openers took a special liking towards the spinners and in front of their aggressive mindset, even Axar Patel, who was bowling mostly wicket-to-wicket, failed to have any impact. Yuzvendra Chahal, who tried to go after Finch, failed to put a stop to the carnage and the small boundaries of the Chinnaswamy helped the Aussies exert even more pressure on the bowling attack. Chahal might have had his moment with the second ball of the 23rd over when he beat Finch with his flight, but MS Dhoni missed a stumping which allowed Finch to complete his half-century a couple of overs later. The 148-run stand in the first 25 overs meant that Australia were in a great position to launch a late onslaught to put up a competitive total for the first time in the series. With the regular bowlers failing to put the visitors under any sort of pressure, the Indian skipper was left with no other option than to introduce Kedar Jadhav into the attack. And the Maharashtra offie didn’t disappoint as he baited Warner to go for the big hit and had him caught by Axar Patel at long-on. By then, however, Warner had already become the first Aussie batsman to score a century in his 100th match. The wicket gave India the perfect impetus and it was Yadav, in his second spell, who made full use it and got rid of Finch, who missed his second century in as many matches by just six runs, and Steve Smith in back to back overs to restrict Australia to 240/3 by the end of the 38th over. The two quick dismissals affected Australia’s scoring rate as Travis Head and Peter Handscomb failed to collect boundaries in the early stages of their partnership, but opened up a bit in the last five overs before Yadav cut short Head’s stay by dismissing him for 29. Handscomb, however, did strike a few blows, in the company of Marcus Stoinis, and helped the visitors reach a competitive total of 334/5. Chasing a 300+ score for the first time in the series, India got off to a good start through Ajinkya Rahane who hit a boundary apiece in the first three overs to keep the scoreboard ticking right from the first over. Sharma then joined the action by hitting both Coulter-Nile and Cummins for sixes in consecutive overs. With Indian opening pair looking dominant yet again, Australia made their first bowling change inside the first powerplay but it bore no results as India managed to reach a score of 65/0 by the end of the 10th over. With the powerplay ending, Smith was quick to spread the field out and it had a quick impact as the Indians failed to score a boundary for the next six overs and taking the advantage of that, Sharma broke that streak by hitting Adam Zampa for two sixes in the same over to bring up his fifty. A couple of overs later, though, the pressure paid off as Rahane, while attempting a big hit, was caught by Finch at long on. Kohli and Sharma started to play their shots against Richardson and Head taking the score to 127/1 at the end of the 22nd over. However, that is when it started going wrong for the hosts. Over the next three overs, India lost both Sharma and Kohli whilst scoring just 22 runs. The former was sent packing after being involved in a running mix-up with his captain, who in turn chopped the ball onto his stumps to leave the hosts with 149 on the board with half the innings played. Hardik Pandya was promoted to bat at the No.4 position yet again, and this time the situation was not too different to the previous game - to guide India out of the woods. The Baroda youngster didn’t disappoint, scoring runs at a brisk pace in the company of Kedar Jadhav, who came in at the No.5 spot. The duo decided to bide time at the crease while hitting occasional boundaries to keep India in the run chase. However, things didn’t go as planned for India as Zampa, who Pandya tormented in the Chennai ODI, exacted revenge by getting the all-rounder caught by Warner at long-off. But Jadhav kept the good work going and completed his half-century in the 41st over. When the game seemed perfectly poised in favour for both sides, the rain gods decided to make an appearance at the Chinnaswamy, but relented after a short break, when India needed 84 runs off 53 balls. The interval worked as a charm for the visitors as Jadhav failed to pick up a Richardson off-cutter and mistimed the ball to Finch at long off. With the run-rate rising continuously, the Australian bowlers tried to put more pressure on the Indian batsmen by varying the pace on regular occasions. India’s hopes were pinned on MS Dhoni to do unleash the fireworks, but it never arrived and by bowling him out, Richardson made sure that it was the Aussies’ game to lose. Sure enough, the pressure told as Axar Patel failed to score anything more than 5 and that helped the visitors win their first overseas win in 14 matches.